A lot of people have asked me what kinds of items I find at the thrift store and what I do with what I find, so I thought I’d start a little series highlighting some of my favorite thrift store items. I’ll admit, I really enjoy going to thrift stores. But, I’m the first to say that they aren’t for everyone. You really have to sift through a lot of junk to find a treasure. Often, I go there with a specific need (or two, or three) in mind. Sometimes, I just sort of look around and see if there’s anything that catches my eye. A few weeks ago, this pineapple caught Dan’s eye. Yep, I said pineapple. I apologize for the dark picture. It was taken from my phone. 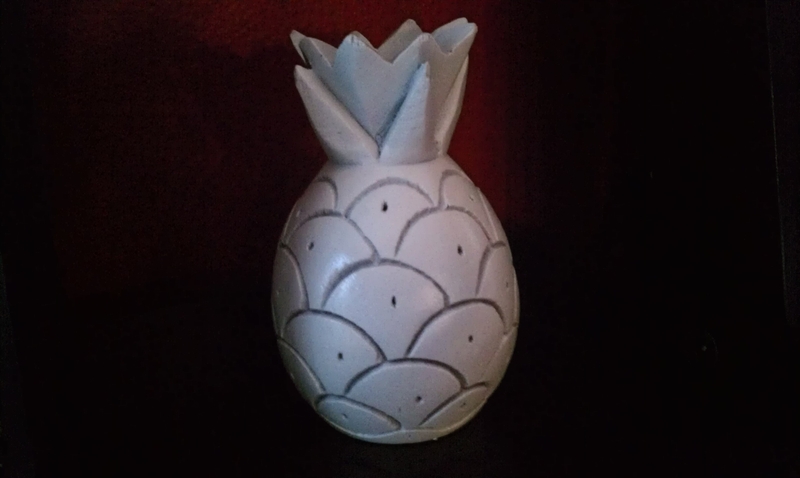 The pineapple looks like it was once a candleholder for a really skinny candle. Not really our taste at all. 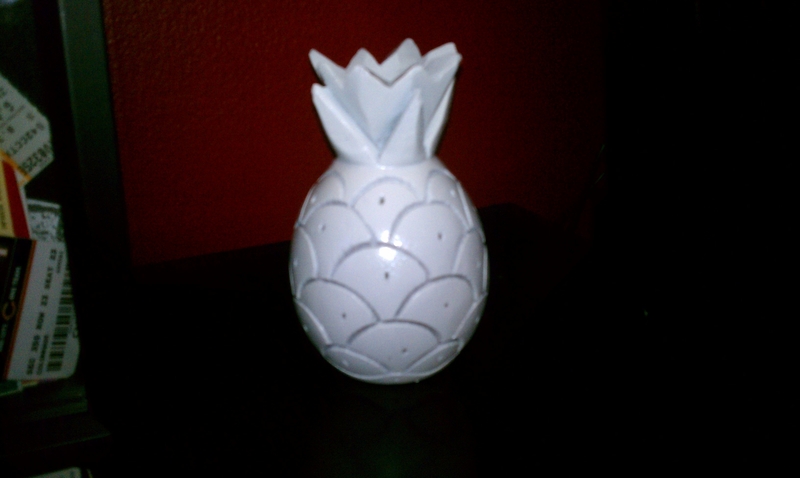 When Dan pointed out this pineapple, I knew we had to have it. For about $1, we took it home. As mentioned earlier, it was kind of ugly, but Dan had a great idea. We spray painted it white. I like how the texture became much more apparent with a brighter color. 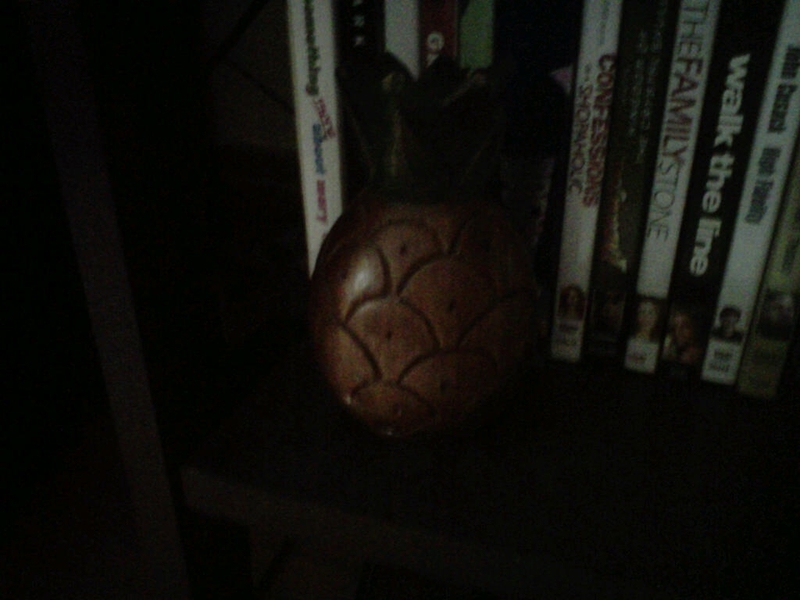 This guy hangs out on our bookshelf and reminds us of one of our favorite shows to watch together. Fun, kinda kitschy decor on the cheap. Sold.